This is one of my favorite books, and not just for the 30 projects. The commentary is at once hilarious and thoughtful, and the tips and hints are both insightful and inspiring. 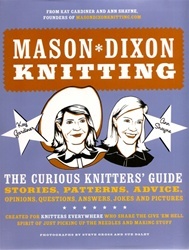 For beginning knitters, this is the book that will give you confidence and cure you of stressing over mistakes. For experienced knitters, this book will bring back a lot of memories, and at the same time get you out of that rut you've gotten into!